Thomas Frederick Martin passed away on April 2, 2019 after a brave, prolonged battle with a series of illnesses. Tom was born March 12, 1943 in Salt Lake City, Utah to David and Margaret Martin. The youngest of two children, he lived in Provo, Utah his entire childhood. He was an excellent student and a champion high school and collegiate speaker and debater. Tom attended the University of Utah and graduated from Brigham Young University with a degree in Chemical Engineering. At the University of Utah, he met Marian Fowers, who was the love of his life, and they were married in 1967. Tom worked as a chemical engineer for Chevron Oil and was transferred to Billings, Montana in 1972. Tom eventually left the oil company and started his own business, Irrigation Systems Inc. Tom and Marian had two daughters, Kimberly and Jennifer. He was a very devoted dad and loved attending their various sporting activities and theater and music productions. Tom went on to obtain a Bachelor’s degree in Information Systems and Accounting from Eastern Montana College. 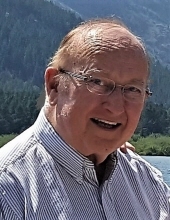 He then began teaching computer classes at Rocky Mountain College and the College of Technology. He was a talented teacher and was well-liked by his students. He later became an employment counselor at Job Service Montana, where he loved his work helping others find work. Tom loved cooking and baking and was forever perfecting his many recipes. He also loved folk music, traveling with family, and spending time with his beloved dogs. He will always be remembered for his jovial nature, upbeat attitude, and sense of humor. He will be greatly missed by his wife of fifty-one years, Marian, his daughters Kimberly Crowther and Jennifer Martin, sons-in-law Mark Crowther and Tyler Decker, grandchildren Ella and Alex Crowther, brother Robert (Margie) Martin, and by his many friends. The family would like to thank Dr. Reese, Dr. Lee, Dr. Duval, and Jan Hollingworth from Billings Clinic, who continually went beyond the call of duty and gave Tom such excellent care. A celebration of Tom’s life will be held at a later date. To send flowers or a remembrance gift to the family of Thomas Frederick Martin, please visit our Tribute Store. "Email Address" would like to share the life celebration of Thomas Frederick Martin. Click on the "link" to go to share a favorite memory or leave a condolence message for the family.